Langkawi is a duty free paradise. In fact, the whole island is duty free, and alcohol, for one, is cheaper than anywhere else in Malaysia. You will also find tempting deals on tobacco, clothing, cosmetics and souvenirs. The airport has the most expensive shopping, with Kuah town featuring the cheapest and the best range of goods. Along with alcohol and tobacco are handicrafts, textiles and chocolates. Kuah has the best shopping in Langkawi by a country mile. The town features several popular malls and department stores, along with the most reasonable prices. Pantai Cenang also comes with a shopping mall and a myriad of outlets along the beach, and there are crafts centres dotted about. At Pantai Kok, the Oriental Village complex has a decent array of shops and eateries. Sime Darby, Langkawi Fair and Langkawi Parade are three of the biggies in Kuah. These malls are loaded with stores and have excellent selections of produce. Sime Darby probably has the best choice, while Langkawi Fair mall is the biggest, with around 100 shops under its roof. The Langkawi Parade Shopping Complex in Kuah is particularly popular for standard duty free items, like wine, spirits and perfume, whilst also providing an array of souvenirs, clothing, luggage and electronics. For those arriving by ferry, check out the Jetty Point Complex. Alternatively, travellers will find that the airport also has shopping options, albeit more expensive ones. Elsewhere on the island is the Zon duty free outlet at Pantai Cenang beach, which is located next to the Underwater World attraction and sells inexpensive cigarettes, alcohol and chocolate. Farther afield, and for handicrafts, is the Kompleks Budaya Kraf up on the north-east coast. 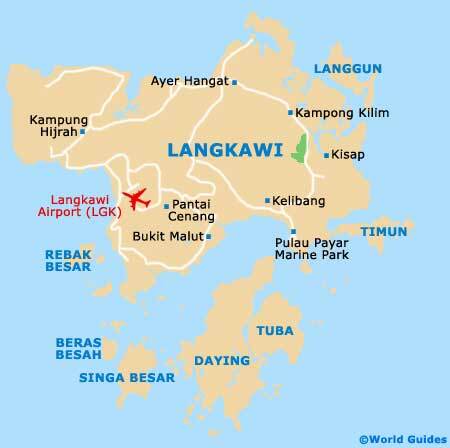 Of note, special gift items to look out for in Langkawi's shops are batik fabrics, clothing, crystal, pottery and pewter.